As StayOnSearch becomes more popular and is quickly gaining more and more loyal readers, I thought it would be a good idea to improve the design slightly and add some new site features. I would love to hear from everyone to get your thoughts on the new design and features. Also if you have any suggestions for how StayOnSearch can improve and become a better resource for Internet Marketing professionals, please let me know in the comments. Here is a quick tour of the updates that have been added to the site. As you can see we gave the logo a new look. The idea was to keep it clean and easy to read. 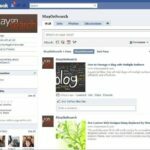 You now have the ability to tweet, stumble and Facebook share any of the posts. We will not be sending out a monthly newsletter with recaps of the best posts of the month, industry news, special offers and more. To sign-up, just enter your e-mail address over in area of the sidebar where it says Newsletter Sign-Up or sign-up using the form below. We have now created a Facebook fan page, where readers can keep up with new blog posts and industry news. 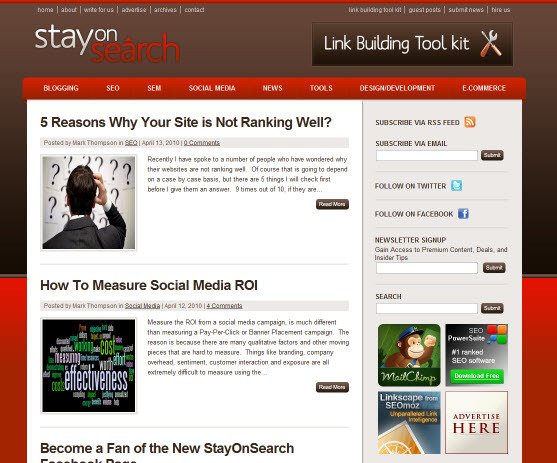 Become a Fan of StayOnSearch. If you would like to contribute a guest post to StayOnSearch, visit the Write For Us page. We are also looking for a few part-time bloggers to help provide valuable content . Ideally bloggers with experience in search and social marketing. Contact Us to become a part-time blogger. The Link Builders Toolkit will launch in early May. The Link Builders Toolkit is an excel document containing the largest and highest quality places to generate inbound links. Each tab on the doc is organized based on the type of links you are looking to generate. Every link on the document is hand picked and is at least a PageRank of 3 or higher. Choose from categories including Social Bookmarking, Events, Blog Directories, Wikis, Content Sharing, E-commerce/Shopping, Free Website Creation, Forums, Local, Photos, Videos, Podcasts, Q&A and much more! Sign-up for the newsletter or keep checking back to see when you can purchase the Link Builders Toolkit. FYI…there will be a great discount during launch week. Users will now be able to submit industry news that they would like featured in an upcoming newsletter, blog post, tweet, or sidebar. I want to give a special thanks to Shannon Noack from Snoack Studios who did an excellent job with the logo redesign and blog skin. I encourage everyone to check out her portfolio to see other examples of work she has done. You can also follow her on Twitter.